A new class at Penn State is a video gamer’s dream—or just the perfect thing if you have ever wanted to design your own virtual realm. Starting this fall, a new course, Game 180N (GN; GA; Inter-domain) The Art and Science of Virtual Worlds, will be offered to first-year students at Penn State Lehigh Valley and Penn State Schuylkill. The course will focus on the physics and foundations of virtual worlds, virtual world planning and design, interactive fiction narration, and application of technologies used for virtual world input and creation, including virtual reality headsets and a variety of web- and computer-based software packages. The course, two years in the making, has been led by Jeffrey Stone, an assistant professor of information sciences and technology at the Lehigh Valley campus, and was supported in part by an Integrative Studies Seed Grant from the Office for General Education. The multi-disciplinary course will be the perfect marriage of narrative arts and physical sciences. It will be taught at the Schuylkill campus by its developers: Michael Gallis, an associate professor of physics, and Nicole Andel, an associate teaching professor of English. At Lehigh Valley, the course will be taught by Stone; Daniel Jackson, an assistant teaching professor of physics; and Michelle Kaschak, an assistant teaching professor of English. To help point students in the right direction for their virtual realms, faculty have been diving into the vast world of computer-generated creation. In the course, students will work in teams to construct the various virtual environments and characters, applying a combination of 360-degree video, programming, and digital imagery. “Mike’s role, being the physicist, is to help them learn about the different physics concepts behind virtual reality and virtual worlds—things like motion and light—so that their ideas can be grounded in what’s feasible, practical, and real,” explained Stone. 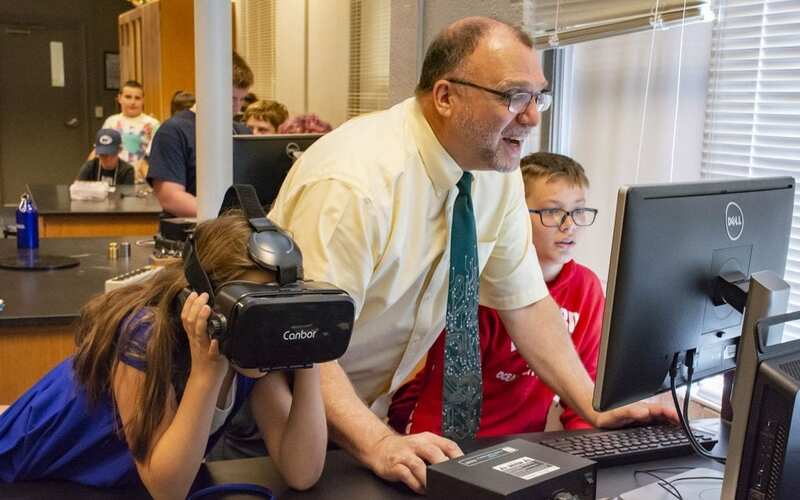 Gallis wants students to learn about the science of observation, including how they make measurements in the virtual world and how they model what is happening in the physical world. In the virtual realm, this becomes interesting, as things can depart from a model for a number of reasons, one of which is due to the fact that virtual worlds may not be exactly correct or complete. The narrative arts aspect of the course will examine what the story and narrative of the virtual world will be and how it will be expressed. Coming from a background in theater, Andel is used to storytelling. As a graduate student, she co-founded a medieval and renaissance drama troupe. Recently, she taught a course on video game literature and she found the opportunity to apply her production expertise. For students, there are many options for future careers in the video game industry, as many skills sets are involved. Students will walk away from this course excited and prepared for a growing industry. Andel hopes professors will branch out into teaching similar non-traditional courses in the future.